I’ve always thought of contentment as simply being satisfied with the THINGS I have and not always wanting more. And until last year, I believed joy and happiness were basically the same thing. But this year, I’ve been studying joy and contentment, in the sense in which they’re used in the Bible, and I’m learning the meanings are much deeper than I previously understood. The Interpreters Dictionary of the Bible defines CONTENTMENT as “the acceptance of ‘things as they are’ as the wise and loving providence of a God who knows what is good for us, who so loves us as always to seek our good. Being content when troubles are flooding our souls, but if we truly do believe our Heavenly a father is always loving, faithful. And wise, and that He does the very best for us in every situation, contentment is possible. 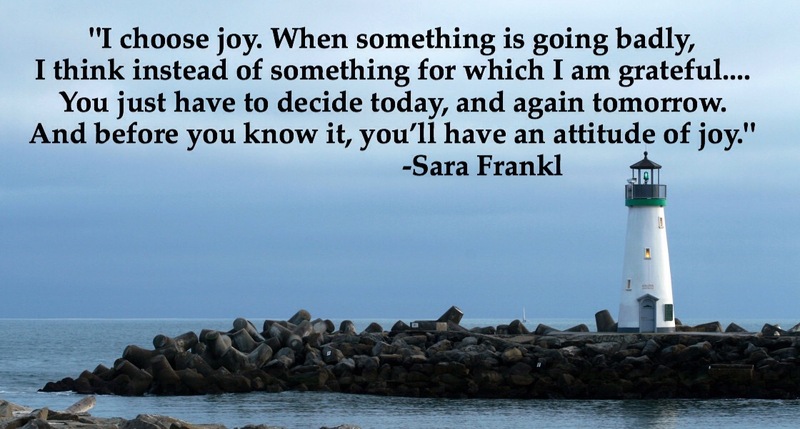 Finding a clear definition of joy was more difficult, but I found an excellent one in a book I’m currently reading, Choose Joy: Finding Hope and Purpose When Life Hurts, by Sara Frank and Mary Carver. Sara was a blogger who suffered almost twenty years with a degenerative disease called ankyling spondylitis, which causes inflammation of the spinal joints, leading to severe pain and discomfort. As time progressed, she faced the loss of one ability after another, until she was no longer able to leave her house. Of all people, Sara had the “right” to complain and become angry at God. But this wasn’t the choice Sara made. This book couldn’t have come at a better time for me. Since last July, increased neck, upper and lower back problems have made me unable to stand or walk (with a walker) for more than five minutes without extreme pain. This all started immediately after an epidural steroid injection in my cervical spine. Then, about a month ago, severe dizziness, nausea, occasional vomiting, and frequent headaches were added to my symptoms. I was ready for some answers – and still am. I’ve seen six doctors, had two MRIs and a CT scan since this started. At my most recent doctor’s visit (with an ENT), a problem with my ears was ruled out as a cause. He suggested I see a neuro-surgeon, saying it sounds like I may have a damaged or pinched nerve in my neck or upper back that is causing the headaches, dizziness and related symptoms. Fortunately, I already had an appointment scheduled with a neuro-surgeon, since the neurologist had also confirmed two ruptured discs in the lumbar spine. I never would have chosen this situation I’m personally facing, but my heart is resting in the Lord. That doesn’t mean my emotions are always at rest. When they make me feel like I want to run away, I have to acknowledge that isn’t an answer. God is showing me ways to walk “in the deep,” and making those choices gets a little easier every time I obey. Thanks to a terrific God-Living Girls with Chronic Illness support group, led by Laurie Shoquist Miller, I have a safe place to go when I need prayer or encouragement. And the two Bible studies I’ve done with this group have given me the tools I need to overcome the desire to run away, or give into fear, anger, or discouragement. When I start feeling overwhelmed, I’m learning to reach out for help, either to the Lord or to a friend. And then I’m making the choice to trust the Lord, be content where He has me, to give thanks for all the good things in the midst of this situation,and before long my spirit is joyful and at rest again. This is a great word, Barbara! It is our choice to be content, and He does help us with contentment. Everything He asks us to do, He helps us to do. What more can you ask? Thanks for your kind comments. This is definitely an increased understanding for me on contentment. My word for the year is joy, and one thing that stood out to me is the similarities between joy and contentment. Barbara, this is a great post – true contentment is something we all want and need – and it’s really quite simple isn’t it. Over the years I have struggled at times with the “choosing” – but finally did learn that leaning on Him, trusting in His goodness no matter where we find ourselves leads to this true contentment. Thank you for your honesty. I love the quote from Tozer! Thanks, Linda, for reading my post, and thanks for your kind comments.